The footage was shot in the Indian Ocean off the coast of Mbotyi by Craig Capehart, a scuba diver who was sitting in a “rubber duck” inflatable boat when the graceful giant decided to make an appearance. He estimates that the whale weighed around 40 tons, but size clearly meant nothing to this graceful giant. 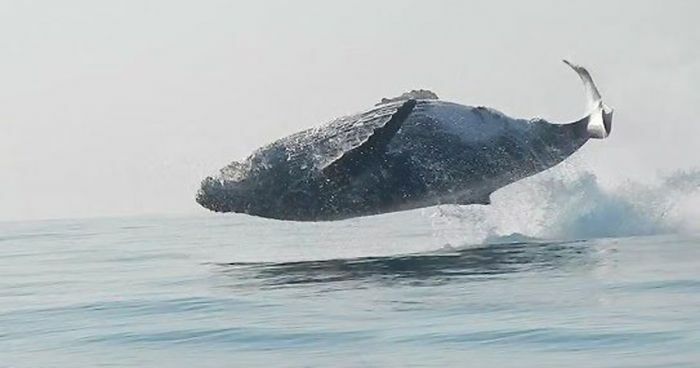 This incredible mammal can be seen leaping out of the water on numerous occasions before it soars fully out the water which is believed to be the first time this occurrence has ever been captured on camera.